Lenovo ThinkStation P310: Power of a Workstation. Price of a Desktop. A powerful processor and immersive graphics deliver powerful performance for mission-critical work. Powerful enough for finance, engineering and architecture, as well as medical and science applications, while boasting unrivaled storage. 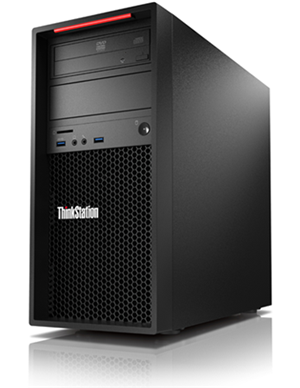 The ThinkStation P310 delivers unparalleled ease of use. Easy access to hardware simplifies upgrades for IT staff. Plus, the clean, functional design makes the P310 exceptionally easy to lift and carry. The Flex Module allows for unprecedented flexibility in customizing I/O ports. Mix and match only the components you need. The P310 provides the ultimate performance with full-featured scalability. Lenovo ThinkStation is a workstation with GREENGUARD® certification. Plus, the P310 is rated EPEAT Gold, ENERGY STAR 6.0, and 80 PLUS® Platinum PSU. So you can feel good about helping the planet while lowering your bottom line.